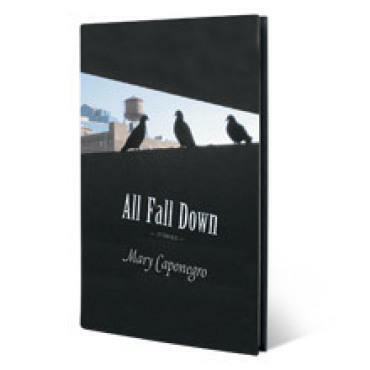 In books such as Five Doubts and The Complexities of Intimacy, fiction writer Mary Caponegro has displayed enough syntactic complexity, dark humor and fabulist tendencies to remain tethered in the realm of experimental fiction. Her latest collection, however, resists that categorization with a more traditional approach; despite its elaborate prose style, All Fall Down is her most approachable work to date. Many of the stories here focus on the moment before the fall: A husband and wife attend a couples’ retreat in a halfhearted attempt to save their doomed marriage; a man nurses his dying mother while ignoring his very pregnant wife; an interracial lesbian couple struggles to stay together when one of them is diagnosed with chronic fatigue syndrome. These scenarios, unlike those in most of Caponegro’s prior work, are very much of this world. Pop-culture references abound, sometimes to distraction: Oprah, Barney, Rugrats, Craigslist, Whole Foods—even Chlo Sevigny gets namechecked. In the longer stories, the characters’ ranting is, occasionally, exhausting to read. “Talking with you is like talking with some annoying child,” says one half of a feuding couple in “Ill-Timed.” “One riff and that’s it, you’re off—you beat it into the ground.” Still, the topical and the comic go hand in hand here, and Caponegro’s witty dialogue is certainly a strength: Few writers so deftly capture the annoyingly cyclical nature of a lover’s quarrel. Caponegro reads Mon 12 at McNally Jackson Booksellers. By Mary Caponegro. Coffee House, $14.95 paperback.